Chances are, when you hear the worlds ‘Nikki Beach’ you think of lavish, lively pool parties perhaps accompanied by an inflatable swan or two. And, most of the time, you’d be right – those guys do love a pool-based party, not to mention a blow-up bird. But away from the splashing and inflatable frolicking, Nikki Beach’s Saint Tropez brunch is a more laid-back affair. 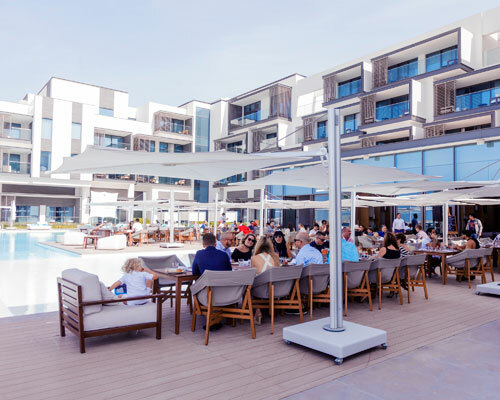 Hosted at Cafe Nikki, the aim here is South of France, with chic, whitewashed furnishings, and views that sweep out across the pool deck, and down the beach. The pumping DJ sets found over at the beach club are gone; replaced by a softer, subtler playlist. A five-course menu, served to the table, is backed up by a multi-station buffet, where plates are layered with fresh salads, cold cuts of meat, freshly baked bread and pre-prepared seafood including oysters, mussels and giant prawns, showcased on a mountain of ice. 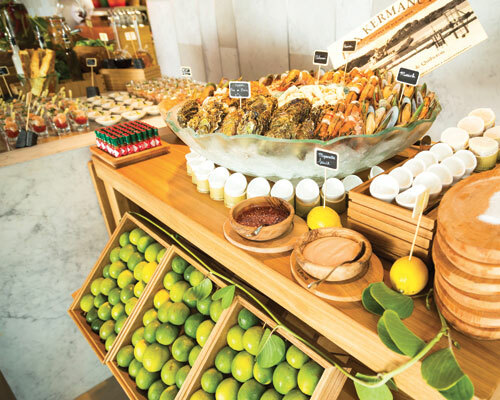 Everything is fresh, and the resort’s army of chefs constantly top up the buffet stations. There are other international influences to be found as well as Southern French fare, including a station dedicated to Nikki Beach’s signature sushi platters, which come served on cute wooden boats. An amuse bouche of chunky tuna tartare, served on squid ink tapioca topped with corriander, signals the start. And what a great start it is. Soon a breakfast dish of asparagus, poached eggs, horseradish hollandaise and smoked salmon will appear – sure it might not be the most authentically Southern French food you’ve ever eaten, but it’s still very tasty all the same. The third course – a locally caught faskar fish en papillote – is a small portion, designed for two to share. It tastes delicious; so much so you’ll wish you had one each. No doubting the authenticity of course four, the plat principal, which arrives in the form of a bouef en daube – a traditional French stew. End it all with dessert – mini desserts are stacked in tall towers, with everything from brulees and chocolate tarts to cheesecake and fruit platters on offer. And perhaps best of all, when you’ve successfully made your way through the Riviera-inspired feast, you can slip into your swimwear and soak up the remaining sun, thanks to complimentary access to the split-level pool and beach area.